This mod wouldn't have been possible without Dreanog of me3explorer's forums. Nor would this have neen achievable without the creators of me3explorer and ME3 Mod Manager. UPDATE: Thanks to the kind folks at me3explorer proboards, its now very possible to create and distribute coalesced mods for general use (without impeding on other users mods). As a result, there is now a version of the Automatic Valkyrie (SEE THE OPTIONAL FILES SECTION) with a larger magazine size (30 rounds, to match standard mag sizes) and improved squad handling. To truly appreciate its improved utility, I recommend trying it out with the Mass Horizons Mod. Just be aware that it handles like a baby ME2-iteration Revenant. Drag and drop the "DLC_MOD_AutoValkyrie" folder into your Mass Effect 3 DLC folder (Mass Effect 3\BIOGame\DLC). 1. 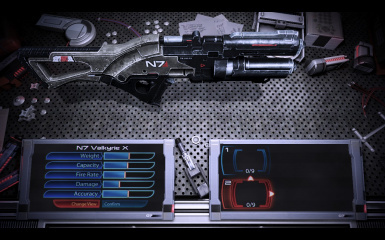 Does this mod supersede other N7 Valkyrie combat mods? 2. 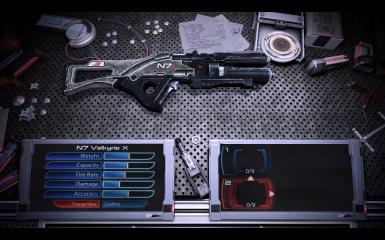 Does this mod affect the multiplayer iteration of the N7 Valkyrie? Update your TOC, via Me3explorer's TOC suite. 4. Do I need additional files, in order to use this game. Yes, you'll need Warranty Voider's modified DLLs.Don't worry these have been packaged with the download.